At Advertising Week, US VP Esther Garcia explained how the cross-border beer brand jumped into a major debate. When a Presidential candidate threatens to physically divide your business into two antagonistic factions, what should a brand do? That’s the question that faced Tecate in 2016, as then-candidate Donald Trump regaled his audiences with tales of a "big, beautiful" and expensive wall between the United States and Mexico. The 73-year-old Mexican brewing company, which first expanded into the U.S. in 2000, has spent almost two decades building its presence in the American market by appealing to Mexican-American consumers proud of their bicultural identity. Trump’s aggressive anti-Mexican campaigning threatened the cross-cultural camaraderie essential to Tecate’s success. Instead of backing down from the controversy, they walked right into it, with a TV spot by Saatchi & Saatchi NY showing two groups of guys clinking cans over a tiny border wall. 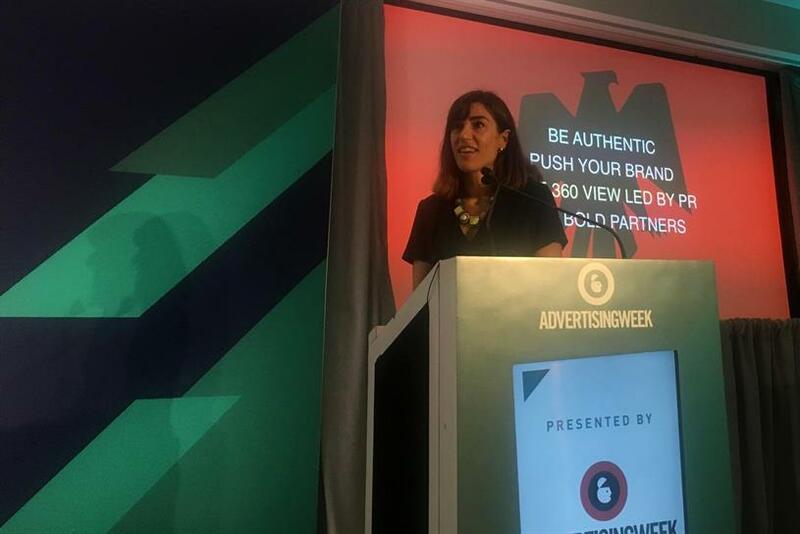 The key, said Tecate US VP Esther Garcia at an Advertising Week panel Wednesday, was that "it’s not about politics—it’s about having a lighthearted point of view and the right to do it." Desire internally at Tecate to address Trump’s promises of a border wall emerged soon after he began espousing the idea, but it didn’t coalesce into a campaign until he became the candidate. "We are a brand that is invested in both sides of the border, and so we needed to do something about it, emotionally tear down that wall," she said. Having spent decades building a brand identity around humor, Mexican pride and masculine confidence, the opportunity was a natural fit. "We could do it because of who we are—the most popular brand in Mexico. Who better to unify the two sides?" But the timing left only a few months between the primary and the debate to execute, a short turnaround for such a fraught project. Tecate had already spent most of their budget for the season on ad buys surrounding a boxing match on September 16, Mexican Independence Day, and anyway, spots for the presidential debate were almost sold out. "We had to be swift, thrifty and bold, [and] focus on media that would create noise," said Garcia. So, they put their dollars in a place whose potential incongruence with their message would grab attention: Fox News. "We said from the beginning we would go [there] to ignite the discussion." Two days before the debate, the New York Times Sunday business section ran a front-page story about the bold move. It worked, said Garcia: "We immediately had a huge response." Having been holed up all day in a war room preparing for that moment, Tecate’s comms team began fielding the inevitable backlash. But it didn’t take long for the tide to turn, and in the end, Garcia said, 87 percent of responses to the campaign were positive. It netted 30 million social engagements and 1.4 billion media impressions overall. Media response was swift and favorable: a CNN commentator praised Tecate for its "courage to decide to make a commercial about something as politically toxic as the wall." Time’s headline: "How Tecate won the debate." "That was our favorite one," said Garcia. Brands considering a similarly risky campaign should learn several things from this one, Garcia explained. "You need to be sure you have the right to talk to the issue"—the authenticity to be an authority—"or backlash will be fast." Boldness should permeate both internal and external strategy: Hire bold people and partners who will challenge moments of fear. "We need to build our brands as well as protect them," Garcia warned. "It feels weird and scary the majority of the time, but [you have to] push to places where magic can happen." And, finally, be strategic from the beginning about comms strategy. This campaign worked only because Tecate planned for backlash management and media interest from day one. "This campaign could have gone very badly, but it didn’t, because our PR team was there to respond immediately." Despite the campaign’s success, Garcia said Tecate will not likely revisit this issue now that Trump is president. "We probably wouldn’t go as big, because we’re not [trying to] offend anyone," she said. "We don’t feel we’re talking about politics." MillerCoors and Mekanism's new beer campaign will literally make you say, "Wait, What?"